Nikolaj Korsholm startet the initiative #Plasticinthebasket because of all the trash he stumbled upon, when he went fishing on the danish coast. He decided to collect plastic in his strippingbasket, everytime he went fishing. Now he hopes to start a smaller movement, or at least awareness. Jeppe and the Gone Fishing Fyn team is back with lots of actionpacked Sea trout content on YouTube. Gone Fishing Fyn is a guide to excellent fishingspots around Fyn, Ærø and Langeland. They give tips to which gear to use, depending on spot, time of year and so on. The most popular lifestyle-show on Swedish national TV, visited us here at Sea Trout Fyn this spring. The host, Claes ”Svartzonker” Claesson, is known by many as Swedens no. 1. angler, and along with him he had brought a complete novice – all of Swedesn TV-darling, Agneta Sjödin. How did they manage? 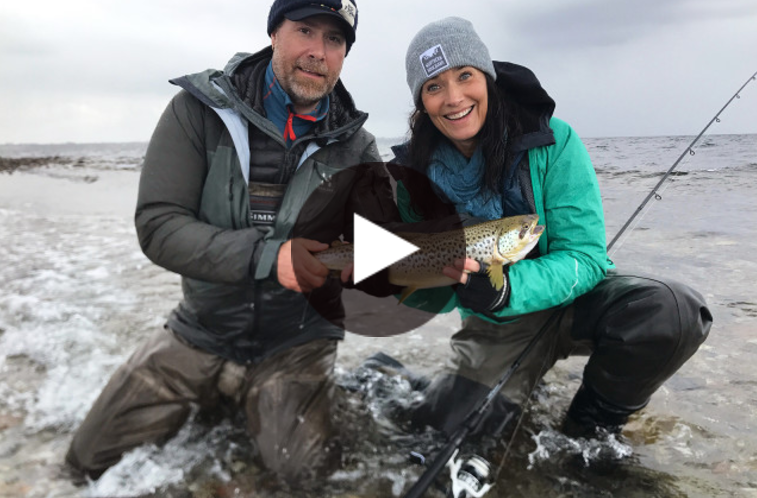 Sea Trout Fyn and InWadersMedia have produced four brand new short-films as an intro to getting success at your trout-game by the shores of the Danish isles of Fyn, Aeroe and Langeland. The 1st episode will focus on ‘’the right gear for sea trout angling’’, the 2nd on ”the right flies”, the 3rd on how to “choose the right location” and finally an episode on our extensive conservation programme to protect the indigenous population of sea trout. Follow the guidelines and get in the water! In the four films we’ll follow two pairs of first-time visitors at Fyn, a father & son Sweden and father & daughter from Norway, as they hunt for sea trout by the shore. The films are part of www.fishtrail.org where you can find plenty more trout-film from around Europe. Nicklas Sorensen of Danske Fiskeeventyr has made this nice video of his fall-season here at Fyn. Follow him in the sun, rain, while wading and from off kayak, as the native sea trout seem to be here, there, nowhere and everywhere. Enjoy. Thomas Hansen and Claus Eriksen known from the movies “Sea Trout Secrets”, are this spring challenging each other in a fierce Sea Trout Battle on the isles of Fyn. Along with their fishing companions, they search for the highest number and the largest sea trout of the competition, which is spend over four intense days of fishing. The Sea Trout Battle will be published in four episodes over November, December, January and Frebruary.